Dart’s massive Igloo Beer Cave, has all of your 12 pack and larger package needs filled. Just step in and find your favorite from among the 100’s of packages stored in the Igloo at ice cold temperatures, don’t stay too long, it’s cold in there. We have a long, long line of spirits. Dart has over 5,000 square feet of liquor inventory, more liquor inventory then most entire stores have in total square feet of shopping and storage. Over $10,000 worth of premium Cigar inventory, expertly stored in Dart’s walk in Cigar Humidor. If you don’t see your personal favorite and would like us to order it for you, send Dart an Email with your request. Dart Beverage Center has just expanded and remodeled the entire Wine Cellar to triple the selection. Our implemented improved product flow, labeling and display so of the 1500 wines we carry, you can quickly find what you are looking for or just explore in new and innovative ways. What Makes Dart Beverage Center So Unique? Our all new Ice Fortress Cooler specifically designed for 22 oz “Bombers” and ciders. The only dedicated cooler just for Bombers and ciders. The Dart Beverage Center Moonshine Shack has 6 drafts on tap that are constantly changing providing you fresh and unique beer that you can take home and enjoy 64 Oz at a time. Perfect for parties, enjoying the big game or just lounging around enjoying fresh draft beer. We now have 64 oz amber glass growlers, Stainless Steel Hot/Cold growlers and Stainless Steel Beach growlers. And Here Is A Lest Off What We Have Currently In Stock. 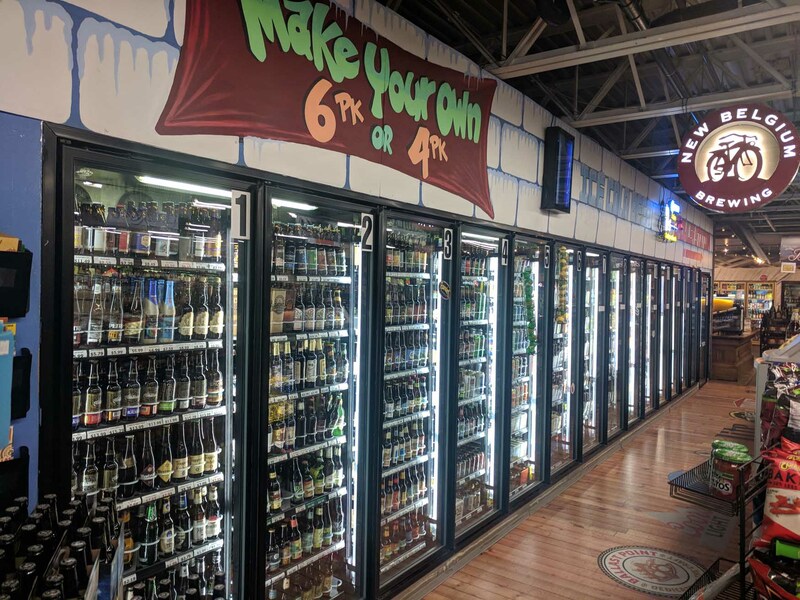 At Dart you have choices and with our Ultimate Mix and Match, you can choose between 12 oz beers or cans and we treat you like you were buying a straightforward 6 pack. No one else anywhere offers this kind of selection with this kind of choice.